IMPORTANT: If you plan on going to Anfield to see a game it is best to get the Membership Light package and if you just want to be a member without the need to buy tickets International Membership is available. More information and benefits are here and there is a breakdown below of our additional perks for being a member. 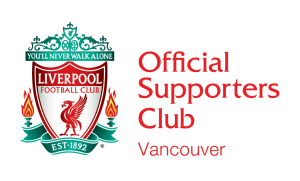 The main purpose of LFC Vancouver is to be able to get together and watch games as a group. Our home venue is at the Butcher & Bullock Pub in downtown Vancouver at 911 West Pender, a few minutes walk from Burrard and Waterfront Skytrain stations. We will be gathering there for every televised game. Both paid and unpaid members are more than welcome to watch the games, however for cup finals and other noted important games, members will be given priority entry to the pub and first choice on seating. 10% all merchandise from Vanfield Soccer Shop. This includes all Warrior LFC goods and all other store merchandise. We’ll add you to our email list which will notify you of games coming up on TV, and of our gatherings for games. We’ll even write them in PST (Pacific Standard Time) so you don’t have to do the time zone math. If you’d rather not get email from us, check the site instead. Oh, and non-members can be on the email list too. Again, to get these discounts you will need your fan card as provided by LFC when you sign up for your membership so don’t lose it! As always, we are working on more and more perks as we go. LFC Vancouver on Facebook. Click here. This has become a very active community and a great place to see current photos, participate in conversations and stay on top of current information. If you’re on Facebook (and who isn’t these days?) definitely sign up and say hi! Can I come to watch the match if I’m not a paid member? – Of course, all are welcome for when we get together to watch games but only members are eligible for any prize draws we might have for some LFC themed loot, or discounts on food at the pub or entry to any parties we hold. Remember too that members will get priority entry and seating for cup finals and select big games. There will be lots of notice on the email newsletter and the Facebook page so there won’t be any surprises! How do I know when the get-togethers are for games, and of any last-minute changes? – The world of watching games on an 8 hour time differential, in a country that doesn’t prefer “soccer” as its sport of choice leads us to having important Champions League games bumped for bloody curling, or a scheduled game will suddenly be tape-delayed for no apparent reason. We do our best to keep up with scheduling and on occasion will email any schedule changes at the last minute if need be. So your best bet is to join our email list (paid or unpaid members can sign up) and we’ll fire out weekly emails updating everyone. Again, you can also join our Facebook group which is updated constantly. Is there membership available without joining through the Liverpool FC website? – For us to be an official branch associated with Liverpool FC, this is the only way membership can and will be offered. This is important for us to offer our supporters access to match tickets along with other perks from being associated officially with Liverpool FC. If you choose not to pay, you are more than welcome to watch games with us and enjoy the atmosphere and banter we create. We pride ourselves on our support and passion and welcome new faces to our group.